Today the EBU finally revealed the running order for the 2 Eurovision semi-finals which will take place on 19th and 21st May. Austria, France, Spain and Australia will vote in this semi-final. My first thought: oh no, what a bad bad draw for Belgium! It doesn't look too good for the Netherlands either. On the other hand I'm sure Denmark and Albania will be whooping with delight at their draw positions. And I just hope that Estonia and Macedonia stand out in their part of the draw too. First thoughts on this one: Lithuania paying the price for being uptempo - although I still think they're charming and charismatic enough to see this through to the final. Hope Montenegro and Norway don't suffer from their early-ish draw positions. Slovenia - which I still see as one of the main challengers to Sweden - has a cracking draw too. Over the coming weeks I will be taking a look at this year's entries in more detail, as well as posting my backlog of national final reviews. Back soon! What do you mean, this blog is 8 years old tomorrow ???? Where have all those years gone? On the one hand, it feels like only yesterday when I was taking those early steps into blogland; on the other hand, it's like a lifetime ago. The world is a different place now, from when I started this blog in March 2007, and one of the things which particularly saddens me is the increasing 'globalisation' of music and popular culture in our continent over the past few years. Europe has such a rich and diverse mix of music and artists who have to take a backseat to the overrated global successes. I just have to work a lot harder now to find any music I like, outside Eurovision/national finals season! Luckily that's not so difficult, thanks to other bloggers and/or Twitter. I won't go into personal stuff here (Random Ramblings is for that) but suffice to say that the last couple of years have been particularly difficult; this has impacted on the amount of time I can devote to my blogging hobby. Yet blogging is something I can't imagine not doing, even if I just don't always have the time and energy any more. I've said it before and I'll say it again: blogging changed and enriched my life in so many ways. That's a good enough reason to keep going into EuropeCrazy's 9th year! Not someone who failed to make it to boot camp in X Factor. Not someone who got past the battle rounds of The Voice. Hello, Electro Velvet. And it's no surprise to learn that the haters gonna hate. It's Royaume-Uni after all!! And it's.....different!! So, after all the nerve-wracking, stomach-churning anticipation, at 9.30pm on Saturday night, 7th March, the BBC finally revealed the song which will represent our country at ESC this year - "Still In Love With You". It's certainly very different from what we expected: if Eurovision existed in 1929, then this would have been the chart-topper of its day. And Strictly Come Dancing might finally have found a new song for a Charleston routine. Over recent years the United Kingdom has performed miserably in Eurovision, with a parade of unknowns and 'old' stars regularly propping up the right-hand side of the scoreboard. We haven't won since 1997, and weren't helped by the introduction of free language two years later. I guess that the main problem with our country's participation in the contest is that on the one hand, we can be expected to dominate the world's music markets at any given time, yet this is never reflected in the songs we send to ESC. And that goes back a long, long time! Yet every year we UK fans hold on to hope, that as ESC becomes more 'credible' and more popular every year - social media has absolutely given the contest a whole different dimension - that maybe one of these years the UK will select a song which will remotely reflect what's happening with our music scene at the moment. Although reflecting 'what's popular' would probably involve some dreary acoustic/pseudo-soulful/overrated artist nonsense, I won't name names but a glance at the recent Brit awards nominees reflects my ongoing dissatisfaction with the 'popular'. Nevertheless, there is always the hope that the UK will choose a 'name' performer with a heavyweight song which will finally prove to the rest of Europe that we-are-serious-about-Eurovision-and-want-to-win-so-please-vote-for-us. Electro Velvet are not those performers. "Still In Love With You" is not that song. I doubt if I will ever listen to "Still In Love With You" outwith Saturday 23rd May: it wouldn't be a song I would choose to listen to, but Eurovision is a different universe, And almost four hours after hearing the song for the first time, I can still remember it. So the song has ultimately done its job, whereas I still struggle to remember many of the entries already chosen. And as one of the big 5/6/7/whatever it is these days, they only get one shot to impress the viewers in the final. The main problem remains with the BBC's selection process. They can no longer trust the public to choose or entry (Scooch, anyone??) so it's now an internal selection, revealed somewhat sheepishly on a 'Red Button' launch, which speaks volumes about the BBC's reluctance to give the contest a higher profile in this country. And then they wonder why no-one votes for us, eh? This is also a bit of an insult to the artists as it sends out a clear message that the Beeb doesn't think they're worth a proper showcase on 'real' telly, but are stuck on the 'Red Button' instead. That whoever gets the poisoned chalice of representing the UK in Eurovision is essentially collateral damage, risking career suicide and sacrificed as Euro-failures if the desired result doesn't come our way in May. 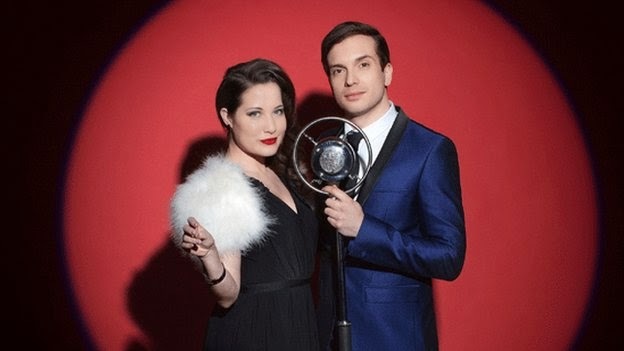 So perhaps as an act specifically put together for ESC, Electro Velvet have probably already pre-empted that and will probably go their separate ways on the 24th of May, but before that, they will have had a blast representing the UK and enjoyed that brief moment in the spotlight, not to mention Eurovision notoriety for better or worse....! EDIT 10.03.2015: I haven't been able to get this song out of my head since Saturday night! I'm jumping into my Eurovision time machine once more for the latest in my occasional series. 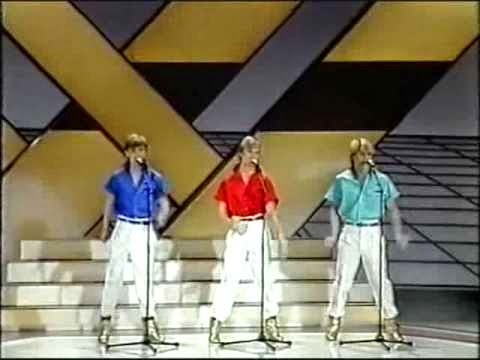 And it's a bit different this time, as I'm taking a look back at a contest which, probably in all my years of Eurovision fandom, is the one I have the least memory of: Eurovision 1984. I had a number of reasons for this. Since 1981 I had discovered that other music existed outside the chart-pop bubble, and I started to explore the indie/alternative music scene. Yet both that and Eurovision could both live side by side in my diverse musical world. So, I continued to watch and enthuse over the 1981, 1982 and 1983 contests. But something very strange happened in 1984: I lost interest in Eurovision. It struck me recently that I had no memory of the 1984 Eurovision Song Contest, so I decided to revisit the show and explore the reasons why it was the one I couldn't remember. As I said in a previous post, you had to feast on every little scrap of information about the contest back in those days, and it was only the Eurovision Song Contest previews which gave you any idea of what the songs sounded like. I can't even remember watching these, but I made sure that I would tune into the contest anyway. With my growing interest in alternative music, I had not only drifted away from mainstream pop but briefly lost interest in music from other countries too. By that time the 1984 Eurovision Song Contest rolled round, it was less relevant for me than it had ever been. Luxembourg had won in 1983, and at the time that had been a major disappointment for me. So in the time-honoured tradition, the 2014 contest was hosted by Luxembourg's RTL, with the multi-lingual - and somewhat 'quirky' for the time - host Desiree Nosbusch. Watching the contest now, I remember why I didn't remember it. None of the songs floated my boat, and it was downhill all the way from the first song - and that year's winner - "Diggi-Loo Diggi-Ley". To this day, that song remains one of my least favourite ESC songs/winners: despite their exuberant performance, the Herreys delivered the type of song which the UK media uses to beat the contest over and over again to this day. I had invested in Sweden's entries since Abba and this just disappointed me on a grand scale. It's all terribly bland, until Norway's Dollie de Luxe at least try to drag the over-the-top 80s into their performance, but the fact remains that for me, this falls short of their original MGP performance. Over in Ireland meanwhile we had a young Linda Martin competing with the impressive Terminal 3, written by Johnny Logan. I do remember at the time that I'd have been happy with this winning. Only that and "Lenge Leve Livet" are the only 1984 ESC songs I still play. Looking back at the 1984 contest it seemed to be somebody else's idea of what a song contest of the 80s should look like, with all those nods to 80s fashion, but the sounds definitely belonged to another time and place. (In the UK's case that would be Detroit in the 60s as Belle and the Devotions tried to recreate the sound (if definitely not the look) of that era with "Love Games") but the look and feel of the whole contest is brutally old-fashioned for its time. Yet even in those days I had a little Swedish obsession going on, so despite my hatred of the Herreys and their boots and dance routine and diggy-loo-ing there was one redeeming feature. Sweden would be hosting Eurovision the next year and by that time I would be back in love with the contest again.